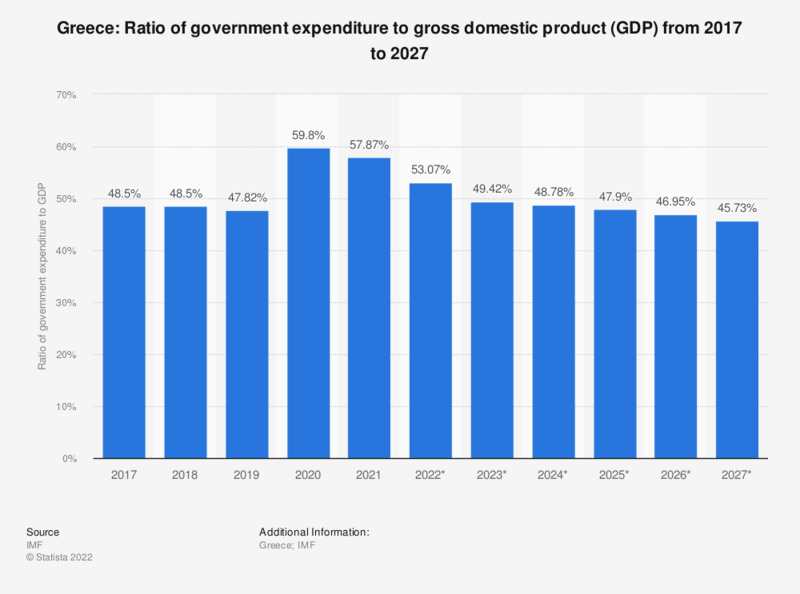 The statistic shows the ratio of government expenditure to the gross domestic product (GDP) in Greece from 2012 to 2017, with projections up until 2022. In 2017, Greece's government spending amounted to about 47.96 percent of the gross domestic product. In 2011, the ratio of government expenditure to GDP in Greece started to decrease significantly from 53.73 percent to 46.36 percent in 2014. However, looking at Greece’s ratio compared to the other member states of the European Union, it shows that Greece - while still having a relatively high ratio - is not at the top of the list of countries with a high public ratio. Yet, Greece has a history of spending significantly more than it has been acquiring in government revenue. This unbalanced spending vs revenue situation is expected to change at some point between 2015 and 2016. When spending more than it received, Greece covered its yearly deficits by borrowing money to make up the difference. The accumulation of these deficits resulted in Greece’s growing debt, which in 2014 amounted to a total of 317.31 billion euros, and with the economic crisis, the country has had difficulties in paying back its large debts. However, it appears as if Greece is beginning to keep government spending below revenue in the near future. In order to recover, the country also needs economic growth, and according to the IMF, GDP is expected to increase after 2015 and along with it, Greece will likely see positive growth rates.